Welcome to the December 2010 issue of SAGE's Psychology, Counseling, and Psychiatry Newsletter. You'll find important information about our books, reference works, and journals, including several new journals and access to content about Behavioral and Cultural Psychology that we have made available to you through January 15, 2011. Read these articles for FREE through January 15, 2011. Click on the articles below to sample the content in each journal or click on the title to browse through a sample issue. This indispensable journal offers creative and hands-on articles that help you use a variety of resources (for example, technology as a teaching tool) to enhance student learning. Read more. Organizational Psychology Review is a new quarterly, peer-reviewed scholarly journal with the unique aim to publish original conceptual work and meta-analyses in the field of organizational psychology (broadly defined to include applied, industrial, occupational, personnel, and work psychology as well as organizational behavior). Read more. Pre-register for free online access to Volumes 1-3 through December 2013. 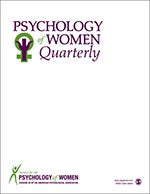 Psychology of Women Quarterly is a feminist journal that publishes qualitative and quantitative research with substantive and theoretical merit, along with critical reviews, theoretical articles, and invited book reviews related to the psychology of women and gender. Read more. Society and Mental Health will publish original and innovative peer-reviewed research and theory articles that link social structure and sociocultural processes with mental health and illness in society. Read more. Musicae Scientiae publishes empirical, theoretical and critical articles directed at increasing understanding of how music is perceived, represented and generated. Read more. View the table of contents of these special issues. For full-text access, you will need either an individual or institutional subscription. Listen to Elaine Walker’s introduction. Genetics, Personalized Medicine, and Behavioral Intervention—Can This Combination Improve Patient Care? The American Psychoanalytic Association (APsaA) kicks off its 100th anniversary at its annual Meeting in January 2011. Founded in 1911, APsaA is the oldest national psychoanalytic association. The 100th anniversary year will salute a century’s worth of psychoanalytic contributions to American culture, academia, and health care. The International Association for Correctional and Forensic Psychology (IACFP) is an organization of behavioral scientists and practitioners who are concerned with the delivery of high-quality mental health services to criminal offenders, and with promoting and disseminating research on the etiology, assessment, and treatment of criminal behavior. Benefits include print and online access to Criminal Justice & Behavior and more than 55 other criminology and psychology journals. *To receive your 30% discount you must enter Promo Code: Email 30% in the Comments and Special Instructions field during the online Checkout process at www.ia4cfp.org - the discounted rate will not be shown at time of checkout, but your credit card will be charged the discounted amount. Looking for high-quality, low-priced textbooks for your course? Qualified adopters can request a complimentary review copy of these new and upcoming textbooks. This text offers comprehensive coverage of both classical and contemporary systems of thought, connects psychology to evolving society and culture from ancient times to today, and provides scores of contemporary applications that draw students into the topic. Read more. This text was class-tested and the student response was clear…Child Development engages students in an ACTIVE learning experience. It provides students with the tools they need to think critically about child development in this course and beyond. Read more. Sign up for a free trial to the following journals. Recommend these journals to your librarian. Follow the Small Group Research blog.